UK citizens believe Muslims want to form a “fifth column and kill us” and laws against discrimination on the grounds of race and color should be scrapped, according to UKIP leader Nigel Farage. The controversial politician made the comments during an interview for Channel 4. He told former Equality and Human Rights Commissioner Trevor Phillips: “I think perhaps one of the reasons the polls show an increasing level of concern is because people do see a fifth column living within our country, who hate us and want to kill us. 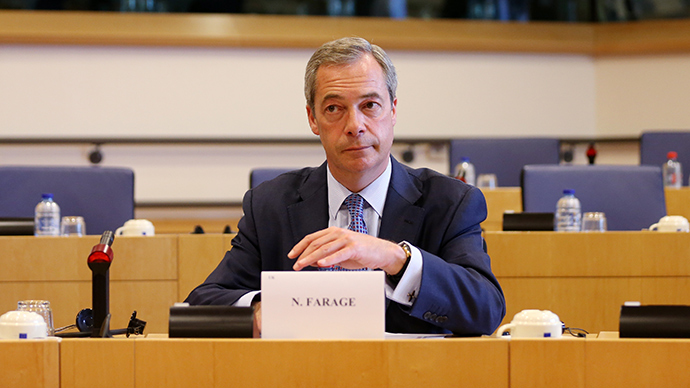 Farage also criticized anti-discrimination laws regarding recruitment, suggesting they were no longer needed. “I think the employer should be much freer to make decisions on who she or he employs. “I think the situation that we now have, where an employer is not allowed to choose between a British-born person and somebody from Poland, is a ludicrous state of affairs. The mainstream parties were quick to respond to his comments. Labour Party Shadow Justice Secretary Sadiq Khan said, “We have made huge progress on tackling racial inequality and discrimination in this country, partly because of Labour's strong anti-discrimination laws, but things are still far from perfect.